A little over two years ago I took a look at the original This Is the Police. There were a lot of things that I really liked about the original game as it was a really interesting take on running a police station. The game had an interesting story, compelling gameplay, and was a unique experience that you don’t really see all that often in video games. While I really enjoyed This Is the Police there was one glaring problem that I couldn’t get over. The original game was brutally difficult at times to the point where the game felt unfair. Things would regularly go wrong for your police station which would compound until you fell into a spiral of pain and misery. Heading into This Is the Police 2 I would say that I was excited and yet a little cautious as I worried that the same problems would plague the sequel. This Is the Police 2 takes the original game, improves on it in almost every way while also adding a fun new mechanic but still succumbs to the same problem that plagued the original game. We at Geeky Hobbies would like to thank Weappy Studio and THQ Nordic for the review copy of This Is the Police 2 used for this review. Other than receiving a free copy of the game to review, we at Geeky Hobbies received no other compensation for this review. This Is the Police 2 continues the story from the original game. Jack Boyd is on the run from the law after the events of the first game. He ends up settling in the small town of Sharpwood that is not as peaceful as it initially appears. After running into some trouble with the law, Jack meets Lily Reed the new sheriff of Sharpwood who is a little overwhelmed in her new position as the other police officers don’t respect her. Learning of his sketchy past Lily agrees to not turn in Jack if he helps her turn around the Sharpwood police department. Can these two wildly different police officers turn around Sharpwood or are their dark pasts going to catch up to them? While I liked the story in the original This Is the Police, like pretty much everything else about the game This Is the Police 2 brings the story to the next level. At this point I have not finished the game but the game’s story starts strong and has the potential to be really good. The story is definitely mature but if you like gritty cop stories full of corruption I think you will enjoy the story a lot. I think what brings the story to the next level is how much more polish has been added to it from the original game. The game’s voice work is really good for a indie game. The game still mostly uses the “comic” style but also includes the occasional cutscene. I think the biggest reason why the story is better is that it is more ingrained with the gameplay. After most days the story is driven forward which gives the game more time to focus on the characters. This might annoy people that don’t really care about the story (you can skip the story parts if you want) but I think it benefits the game. 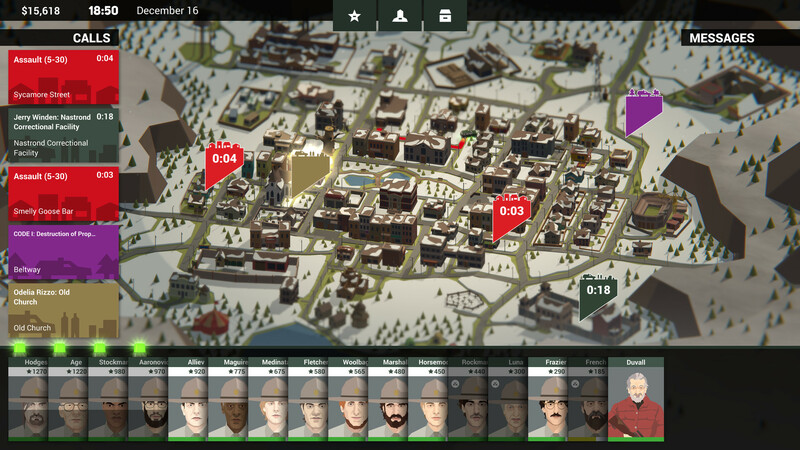 On the gameplay front This Is the Police 2 shares a lot in common with the original game. Pretty much all of the mechanics from the original game are still present in This Is the Police 2. Once again you play as the head of the police. Each day you are in charge of choosing which officers will work that day. Throughout the day you will receive calls from the residents reporting crimes going on throughout the city. You need to choose which police officers to send to the calls. As you won’t have enough police officers (at least early in the game) you have to prioritize which calls you are going to respond to. When the police officers arrive at the scene you will usually be given three options that you can use to settle the situation and your choice usually determines whether the suspect is apprehended and if any civilians or police officers are hurt/killed. There are also occasional crimes where you need to use detectives to find clues to piece together what happened. The only somewhat noticeable difference in these mechanics from the original game is how you acquire new equipment/police officers. You acquire tabs for successfully handling situations which you can spend at the end of the day for new officers or equipment. For more information about these mechanics carried over from the original game, check out my review of the original This Is the Police. Most of This Is the Police 2 may be very similar to the original game but I don’t really see that being a problem. The thing I liked most about the original game was the gameplay and that continues in the sequel. With the sequel Weappy Studio took what they learned from the original game and expanded upon it. Basically This Is the Police 2 takes the mechanics from the original game and adds a layer of polish which fixed most of the minor problems with the original game. The gameplay is just as fun as the original game and is actually better due to the layer of polish added to the game. While This Is the Police 2 is mostly just more of the same, the game actually does add one new mechanic. This is the Police already had plenty of mechanics and yet the sequel decides to add in a turn based strategy mechanic. This mechanic is mostly used to handle situations where the police have to siege a location occupied by hostile forces. When I first encountered this mechanic in the game I was genuinely surprised. With everything else in the game I thought there wasn’t going to be much to the mechanic. I thought it was going to be a very simple mechanic that was tacked on in order to add a little more realism to the game. That is far from the case though. The turn based strategy mechanic is a fully fleshed out turn based strategy game similar to games like X-Com. In each of these situations you are given a certain task like apprehending/killing all of the suspects or disarming a bomb. You are given control of all of the police officers you send to the call and have to move them around a grid based map. The officers are given special abilities based on their skills and you can use the equipment you gave to each police officer. While you are going through the tutorial mission this mode felt a little overwhelming at first but you adjust to it really quickly. You have a lot of control over the situation as long as you don’t have disloyal cops which will do whatever they want. While there is a button to easily reset each siege mission if something were to go wrong, I was genuinely surprised by how tense certain situations can get as you hold your breath that a suspect’s shot misses. This was really reminiscent of X-Com. I honestly was so surprised by this mechanic that I would love to play a whole game based off this lone mechanic. If I were to stop the review at this point This Is the Police 2 would have either received 4.5 or a perfect 5 stars. Unfortunately it is time to address the elephant in the room. By far the biggest problem that I had with the original game was that at times it was brutally difficult and was downright unfair. You would be going about your business and then something would happen and your plans would be destroyed. One of your police officers would get killed, you would lose resources, or you wouldn’t be able to save a civilian. While this sucked it built character for the game as it created a realistic look at life at a police station. The problems arose from the fact that you couldn’t really let some of these things go as they would basically destroy the rest of your game if you didn’t correct them. As you were always short staffed you really couldn’t lose any police officers or it would just make the situation worse. These problems would compound making your situation worse and worse until you were basically forced to restart your game or at least reset to a previous point in time. I would say that This Is the Police 2 slightly improves in this area but it is still an issue. At times This Is the Police 2 is still brutally difficult/unfair to the point where I can see the game heading into the same spiral of pain and suffering as the original game. Due to my experiences with the original game I never let it get that far which meant replaying the same days over and over again. I probably had to replay one day at least 10 times as I kept getting into situations where I would fail a lot of missions or lose police officers due to being understaffed. As I thought this was going to come back to bite me in later days, I just reset the day and tried again. While this kind of feels like cheating, it is almost required if you want to avoid going into the death spiral. To give you a glimpse of what I mean by the game being kind of unfair, let me recount the tale of the day I had to reset at least 10 times. As you are pretty understaffed early on in the game, it is really hard to get good outcomes for most of the cases in the day without several attempts. To get mostly good outcomes (which is needed to hire more staff) you will be required to reset the day a couple times as you try to figure out how to approach the day. The events of each day don’t appear to be randomized so you can learn from your mistakes. A lot of these mistakes came from the fact that my officers refused to work with each other. At the beginning of the game you are given a sexist cop that refuses to work with female cops as well as a female cop that refuses to work with any non-experienced cops. As these are two of your highest ranked cops you basically have to sometime have them work the same day. As they refused to work together I had to leave calls unanswered because I didn’t have enough officers available. I ended up having to reset the day several times just to find combinations where I could answer most of the calls. Then at the end of the day there was a hostage situation. During the hostage situation I had several cops that decided to do whatever they wanted (due to the loyalty system) which mostly meant running into the line of fire or going off on their own. This lead to them regularly getting killed. As I already had a lack of cops this meant that I had to keep resetting the hostage situation until all of the cops decided to finally work together and I was finally able to end the day. This terrible day ended up taking me over two hours to complete. So the reason that I think This Is the Police 2 is slightly better than the original in this regard is that it seems to be a little more forgiving. The devastating events don’t seem to be as prevalent and you seem to have more control over these situations which makes it easier to keep your officers safe. It is also easier to reset to the beginning of the current day even though I kind of wish there was a safe point at some point during the day so you didn’t have to always restart at the beginning of the day. The other reason that I think the sequel is easier/more fair is that after you get through the initial difficulty it seems like the game gets a little more manageable. This could easily change later in the game but if you are able to build up a pretty strong lineup of police officers early in the game, the game does become a little more manageable. This will probably require you to reset some of the earlier days though in order to get more positive outcomes. I really wish the game would have featured some sort of difficulty setting though. I can see the developers wanting to keep the game difficult/realistic but this is going to turn off some players just like the original game. To truly enjoy This Is the Police 2 you will need patience and be willing to occasionally restart a day in order to prevent yourself from being dug into a hole that you can’t get out of. In reviews I generally like to give players an estimate of length but for the case of This Is the Police 2 I am not going to be able to give you one. This is due to a couple things. First I haven’t finished the game so I couldn’t even if I wanted to. I have played for around seven hours and I am far from finishing the game. I ended up resetting a lot of the days though to avoid the eventual problems from the original game so this obviously added quite a bit of time to the game. How much you reset days is likely going to have the largest impact on the game’s length. If you are a perfectionist you are going to spend a lot of time replaying days and if you just wing it you might get stuck in a no win situation and have to go back quite a few days. As far as length all I can say is that the game seems to contain quite a bit of content where you should get your money’s worth if the game’s concept appeals to you. There is a lot of things that I liked about This Is the Police 2. The developers took a game that I already enjoyed and made it better. The story is more engaging and plays a bigger role in the game. The gameplay is the same for the most part but with an added layer of polish that takes it to that next level. If you enjoyed the original game you will appreciate the additions to the sequel. The best addition though has to be the turn based strategy mechanic that was added for siege situations. The mechanic came out of nowhere and blew me away. I found this mechanic so enjoyable that I believe it could carry its own game. The only problem with This Is the Police 2 is that while the difficulty/unfairness has been slightly improved from the original game, it still has a prevalent role in the game. If you play This Is the Police 2 get ready to retry days or deal with the consequences as they can be devastating. It is a shame that the developers could not fix this difficulty issue as This Is the Police 2 would have been a fantastic game if it had been. If the concept of running a police station interests you at all and you can get past the overly high difficulty, I highly recommend checking out This Is the Police 2. Takes the original game and improves it in pretty much every way. Adds a whole new X-Com style mechanic that could have easily been its own game. Is still brutally difficult/unfair like the original game forcing you to replay days if you want a chance to survive. Will not be for everyone.